I've been browsing through the shops for the past month looking for inspiration for our Christmas dinner table. This year will be extra special since we will be spending Christmas in our own house. I'm very excited because it means we get to make our own traditions and my husband will cook the Turkey and prepare most of the dishes, believe it or not. I am of course in charge of the decor and dressing the dinner table which I couldn't be happier about. Ever since I was kid my mum taught me that you put a lot effort into Christmas. She used to change the cushion covers, curtains and have a special table cloth just for Christmas Day. In addition to this, she used make all these things herself with a sewing machine. What an incredible woman! I never really realised how much work it was for her until I have started doing my own Christmas preparations in the last few years. Obviously, I don't make nearly as much of an effort as she used to but I do try. I cut corners where I can. Shops are these days filled with ready made sauces and decorations and it is a big time saver when you have children. However, I do love entertaining and I couldn't think of a more pleasant task than picking the right accessories for our dinner table. It's all looking very Winter Wonderland and vintage inspired this year as you can see. I am still very much obsessed with gold. I really wanted to use gold accessories for this setting but I wanted make sure it's not too 'bling' (if you know what I mean). A table cloth (I prefer white but any colour these days will do to be honest) is an absolute must in my book for such an occasion. 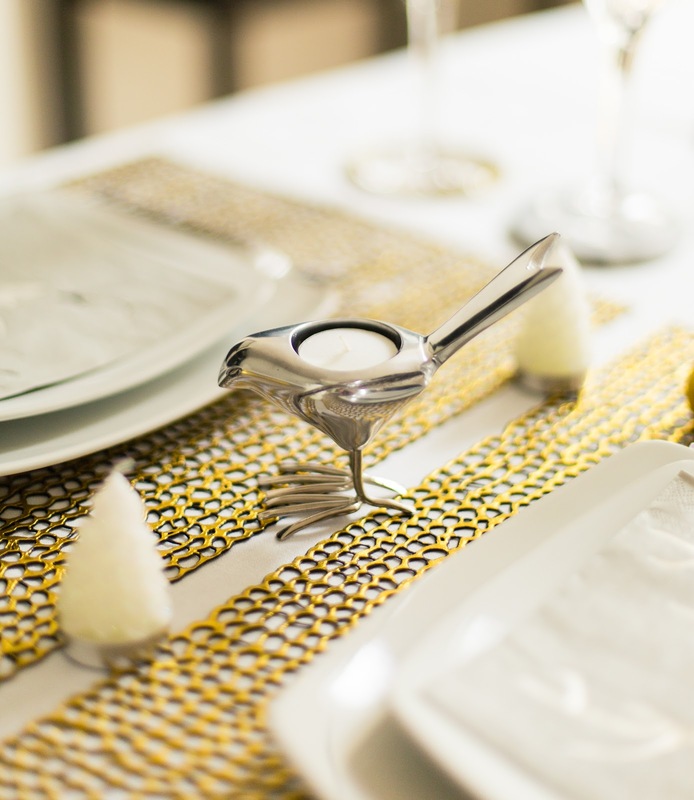 I use place mats on their own with our glass dining room table but special occasions always deserve an extra effort. The only downside is getting the stains out which is why I only use table cloths that can be washed in 60 degrees (although the ironing part is no fun). This is also why I use place mats that are either washable or made of materials that do not stain. I am a big fan of Chilewich and my place mat collection has been growing in the last few years ever since I discovered the American brand. 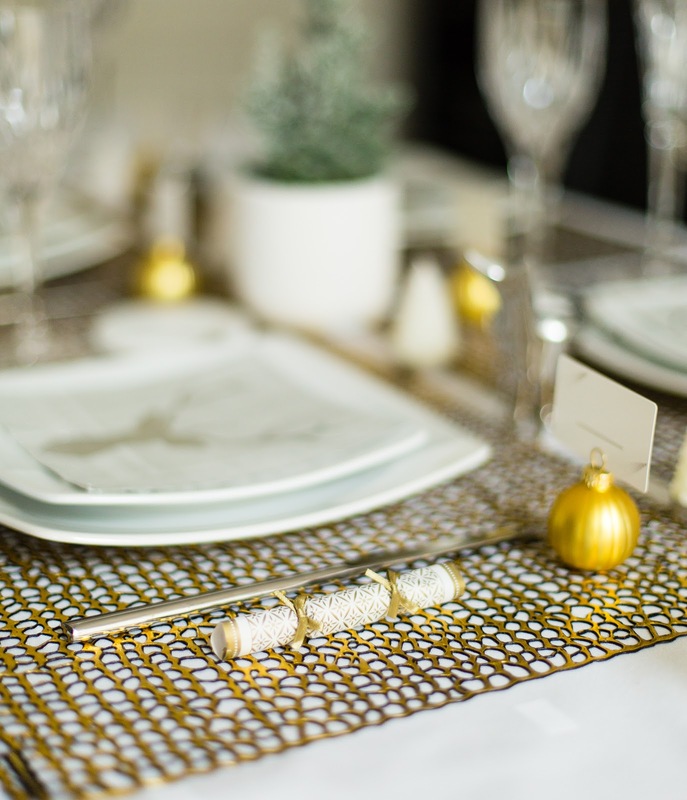 I used Chilewich Gilt Rectangle Place mats for this setting because they are quite glamorous and hard wearing. Unfortunately they have been discontinued but the Dahlia place mats are quite similar. 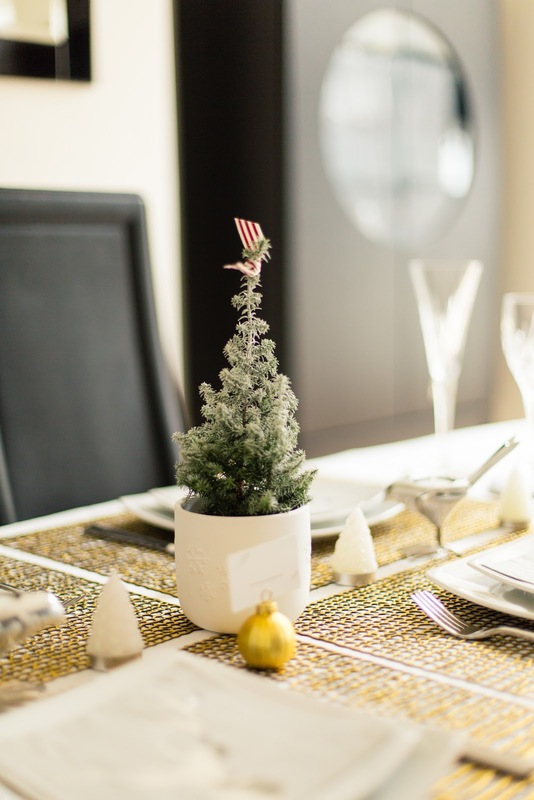 The miniature Christmas planter, candles and tea lights really make the table setting for me. I love using these budget friendly Andante plates from M&S. We use these plates everyday but they are just as suitable for a special occasion as you can see. They are similar to Villeroy & Boch NewWave collection but much lighter and more practical in my opinion. 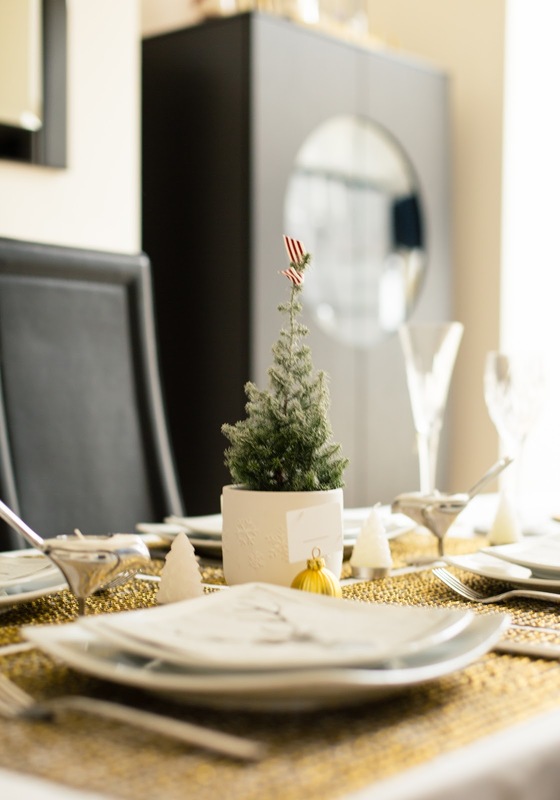 The frosted miniature planter from M&S also adds a bit of magic to our Winter Wonderland theme. I got the place cards from M&S last year but forgot I had bought them which is why this year I am determined to make some use out of them. The bird tea light holders (* gifted) and the Christmas Tree Tea Lights are from Laura Ashley. I'm definitely not afraid to mix silver and gold. And as you can see, this year I decided to add white into the mix as well. I like to keep things simple and it's quite easy to add few glamorous touches to your table setting when everything else is so minimalistic. Our dining room table could be a few centimetres wider but we did buy it few years back when we lived in a smaller place. The length is very good though and it's extendable which has been fantastic. The miniature Christmas cracker and the napkin are both from John Lewis. I much prefer using smaller Christmas crackers in the dinner table. They are more practical and look very subtle compared to giant luxury ones that most shops seem to stock at the moment. 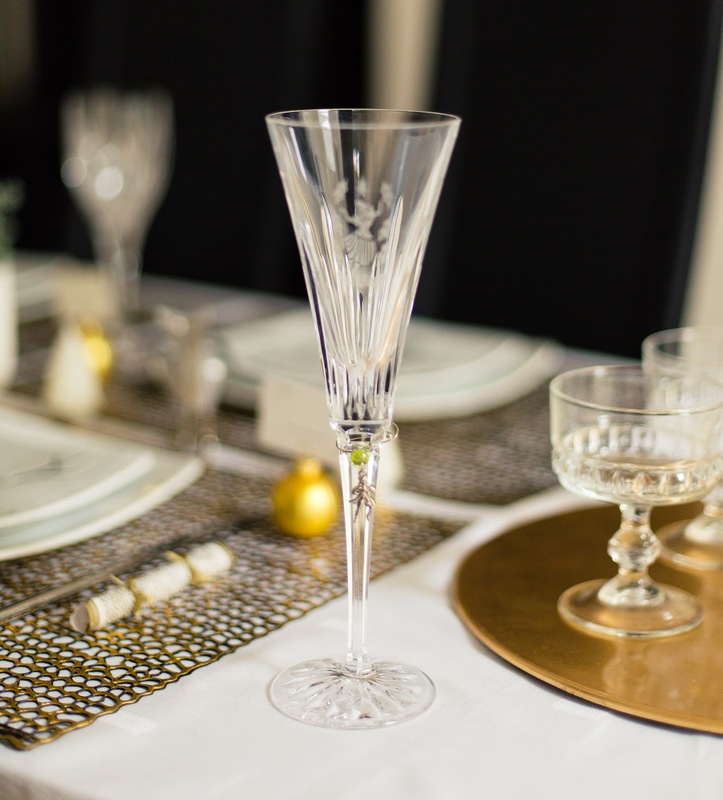 When it comes to Christmas glassware, I am a big fan of vintage. It's much more interesting to have a mix of contemporary and vintage in my opinion rather than just sticking to one style. The dessert bowls (below) were a great find in our local charity shop. 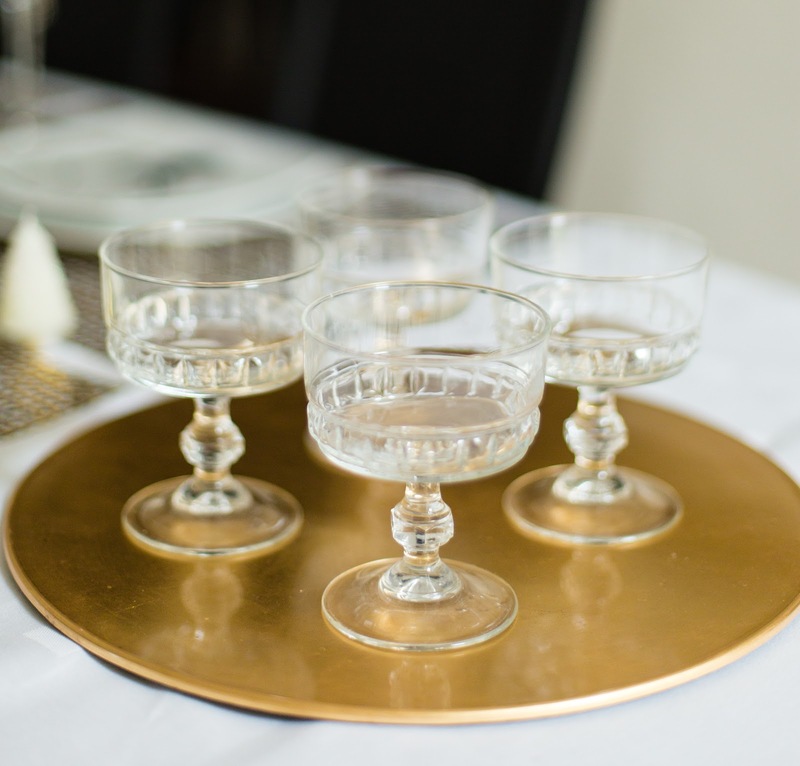 They look chic with M&S gold place mats from last year that also double up as a serving tray. Marble coasters from Rockett St George look great with vintage glasses. 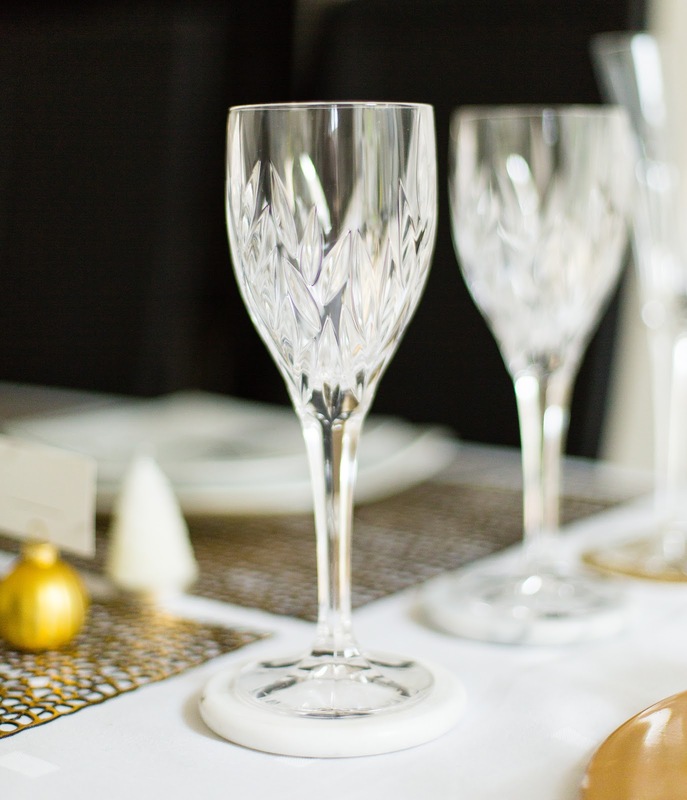 The wine glasses are Galway Crystal and the impressive champagne flutes are Waterford Crystal 12 Days of Christmas Collection that come with a cute charm. Someone recently asked me if I actually have ever used all of our wine glasses. We do have a lot of wine glasses, close to 60 I'd say, but I have used them all and most of them we have actually received as presents from friends and family. I love rotating the glasses and will probably add some more to our collection at some point. The only problem is that I might need a bigger wine glass cabinet soon! We are almost all set for Christmas now. I still need to wrap a few more presents and do some last minute shopping. Our house is looking and smelling very festive though and I have already started baking some gingerbread men. Nothing beats the smell of freshly baked cookies! I have one good tip though for post Christmas clean up. 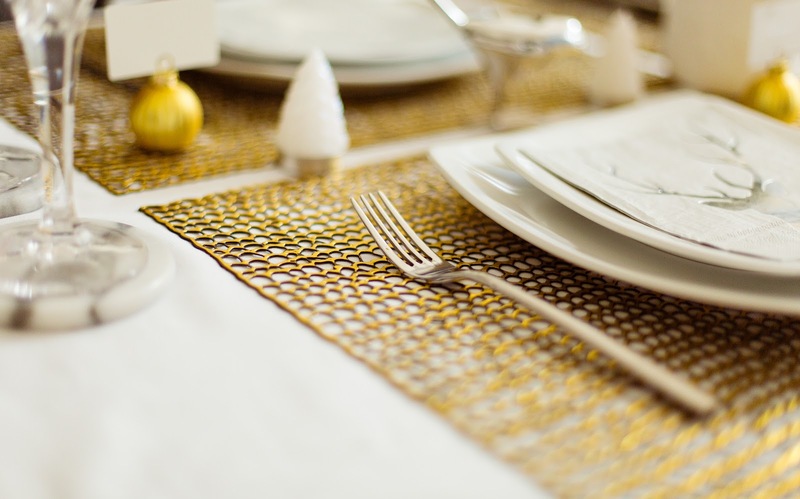 As much as I love using a white table cloth for Christmas dinner, I am always dreading getting the oily Turkey stains out that can be sometimes difficult to remove even in a 60 degree wash. If you get a stain that won't come off, soak the fabric in warm water and Fairy washing-up liquid before trying any other stain removers. So far it has done the trick for me but I usually act pretty quick so the stain won't have much time to settle. Happy Christmas and Happy Entertaining! Your table looks absolutely wonderful! Seriously, it's one of the most beautiful I've seen! 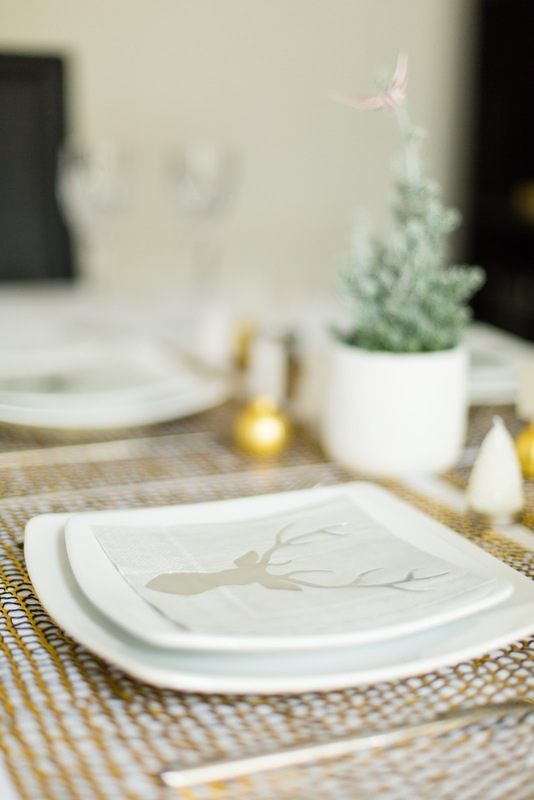 I loved the miniature candles and name card holders, the reindeer napkins, the glasses, everything! 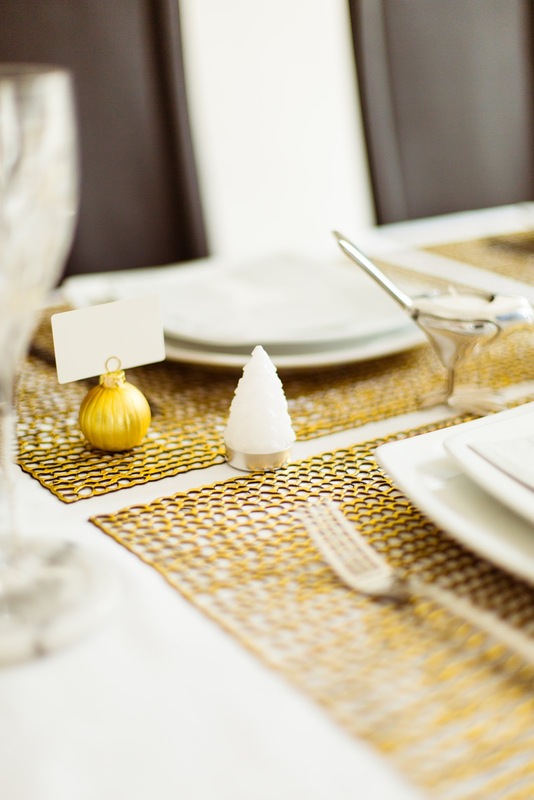 I loved that the colors are simple and minimalistic yet beautiful, cheerful and festive!